“There is complete agreement regarding photos etc., and audio tapes, although the act may allow the disclosure of audio transcripts,” Sugrue wrote to Kane, two other Kane subordinates and to Danbury State’s Attorney Stephen Sedensky, who is directing the investigation of the killings. He wrote: “I just received a call from Natalie Wagner” — a member of the legal counsel’s staff in the office of Gov. Dannel P. Malloy. However, late Tuesday, the legislation proposed by Kane wasn’t ready to be acted on in either legislative chamber, said Malloy’s director of communications, Andrew Doba. He said he did not know when that might happen. “A lot of people, including our office, have heard the concerns expressed by the families of Newtown victims, and are exploring ways to respect the families’ right to privacy while also respecting the public’s right to information,” gubernatorial chief of staff Mark Ojakian said in a statement released by Doba. A major question yet to be settled is whether the legislation would apply only to the Newtown case, or to documents from other criminal cases that are now subject to public disclosure. A report on the police investigation into the Newtown shooting is expected to be released in June. As envisioned by Kane, the bill wouldn’t be limited to the Newtown file. Colleen Murphy, the director of the state’s FOI Commission, said Tuesday that her staff had argued against the idea of such a blanket change. She said a couple of weeks ago the office of House Speaker Brendan Sharkey provided her agency with a draft including the blanket exception. She said she was advised that this draft would not be put to a vote, but she knew nothing abut the contents of the “forthcoming” draft. Murphy said she’d urged that lawmakers be “thoughtful and careful about any legislation” and to “not be reactive to one situation” by making changes that could have long-term, unintended effects. Murphy was unaware of Sugrue’s email when The Courant told her about it late Tuesday afternoon. She said she and her staff had not been receiving detailed updates. Asked if she would have liked to have been kept aware of developments such as Sugrue’s email, she said yes. The killing of 20 first-graders and six women at Sandy Hook Elementary School in Newtown has sparked a number of legislative proposals this year to protect the privacy of the victims’ families and spare them further pain. One example is a bill that would exempt the death certificates of minors from public disclosure for six months. At a White House press conference Tuesday, President Barack Obama praised the April 19 police-military lockdown of metropolitan Boston and dismissed questions regarding links between the suspected Boston Marathon bombers and US intelligence and police agencies. He went on to repeat the increasingly discredited official line that the alleged bombers had been “self-radicalized” and acted alone. Even as Obama spoke, federal officials were announcing that they were seeking to question at least half a dozen “persons of interest” both in the US and Russia who may have been involved in the twin bombings near the finish line of the marathon in downtown Boston. That criminal act killed three people and wounded more than 160 others. On Wednesday, the British Daily Mail reported that Saudi Arabian officials in 2012 sent a written report to high officials in the US Department of Homeland Security detailing their concerns about one of the Boston bombing suspects, Tamerlan Tsarnaev, and warning that he might be planning a terrorist attack. Tamerlan Tsarnaev, 26, was shot dead by police on April 19. 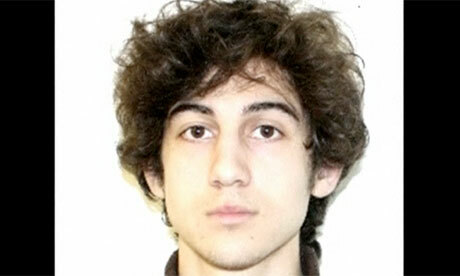 His younger brother, Dzhokhar, 19, is in federal custody in a prison hospital in Massachusetts. A “highly placed source,” according to the British newspaper, said the information on Tsarnaev was based on intelligence developed in Yemen. The letter explained that the Saudi government had denied an entry visa to Tsarnaev in December 2011, when he was seeking to make a pilgrimage to Mecca. The newspaper further reported that a US Homeland Security official on Tuesday confirmed the existence of the 2012 letter. Later on Wednesday, the Saudi embassy in Washington DC denied that the Saudi government had made any such warning to the US about Tamerlan Tsarnaev. Its statement was followed by denials from the White House and the Homeland Security Department. The alleged Saudi warning on the activities of Tsarnaev adds to the evidence of multiple warnings from foreign intelligence authorities and US government acknowledgment of extensive contact between American security and intelligence agencies and Tamerlan Tsarnaev. The US government has admitted that Russian intelligence sent a warning to the Federal Bureau of Investigation in March of 2011 about Tamerlan Tsarnaev and followed six months later with a warning to the Central Intelligence Agency. The Russians said they were concerned that Tsarnaev, an ethnic Chechen, had become a radical Islamist jihadist and was planning to travel to the Russian Caucasus and meet with the separatist underground there. Despite the fact that the elder Tsarnaev brother was put on several terrorism watch lists and was questioned by the FBI, he was allowed to travel unhindered to Dagestan in the Northern Caucasus in January of 2012 and remain in the highly explosive region for six months, returning to the US in July of last year. NBC News has reported that the Russian internal security service also gave the FBI a case file on Tsarnaev in November of 2012, after his return to the US and five months before the Boston bombings, concerning his activities while in southern Russia. NBC reported that the police witnessed Tsarnaev meeting six separate times with a known Islamist terrorist at a Salafi mosque in Makhachkala, the capital of Dagestan. Both Plotnikov and Nidal were killed by Russian security forces while Tamerlan Tsarnaev was in Dagestan. Also on Wednesday, federal authorities arrested three students, classmates of Dzhokhar Tsarnaev at the University of Massachusetts at Dartmouth, and charged them with obstructing justice and making false statements to federal investigators. The criminal complaint does not allege that the students, two Kazakhs and one US citizen, had foreknowledge of the bombings or played any role in them. Rather, it alleges that they disposed of potentially incriminating evidence from Tsarnaev’s dorm room after the FBI had released video footage showing the two Tsarnaev brothers at the scene of the bombings and declared the two to be prime suspects. He then acknowledged that Russian intelligence had alerted US agencies “about the older brother as well as the mother, indicating that they might be sympathizers to extremists,” but went on to whitewash the fact that the FBI, CIA and Homeland Security Department took no steps that could have prevented execution of the terror plot. Not only did this de facto state of siege violate virtually every civil liberty inscribed in the Bill of Rights, but Obama’s Justice Department decided not to read Dzhokhar Tsarnaev his Miranda rights to remain silent and have a lawyer present at any interrogation. The Los Angeles Times reported that the interagency High Value Detainee Interrogation Group ignored repeated requests for legal counsel from the severely wounded suspect during 16 hours of questioning. Obama’s attempt to portray the alleged Boston bombers as lone-wolf terrorists who operated without any external help or foreign ties is consistent with the official line given out by the White House since the killing of Tamerlan and capture of Dzhokhar Tsarnaev. It appears that this claim is motivated by a desire to divert attention from the connections of the suspects with US intelligence agencies. In addition to the multiple warnings cited above and evidence of direct contact between Tamerlan Tsarnaev and reputed terrorists in Dagestan, other facts belie the official story that the elder brother dropped below the radar of the FBI, CIA and Homeland Security Department due to a “failure to communicate” on the part of the agencies. After his return to Boston from Russia last year, Tsarnaev, according to the Washington Post, “assembled an extensive playlist of jihadist videos online.” And he was ejected from his mosque in the Boston area after making inflammatory anti-American statements. As one media source recently noted, since 9/11 the FBI has maintained a program of surveillance and the use of informants in mosques across the US. Such was the case in the attacks of September 11, 2001. Such also was the case in the failed attempt by Nigerian Umar Farouk Abdulmutallab on Christmas Day 2009 to ignite a plastic explosive device as a Northwest flight made its final descent toward Detroit. In that case, the father of the perpetrator had visited the US embassy in Nigeria one month earlier to warn authorities about the terrorist connections of his son in Yemen, and American authorities had received warnings of plans by Yemen-based Al Qaeda in the Arabian Peninsula to attack the United States. So too in the Boston Marathon bombings. If this were merely yet another staggering security failure on the part of US police and intelligence agencies, why have those officials responsible not been named and removed from their posts? Why is Robert Mueller, the head of the FBI at the time of the 9/11 attacks, still running the agency? Claims of mere incompetence or “lapses” are not credible. The most elementary precautions, according to the official story, were somehow not taken. It is claimed, for example, that the FBI never informed the Boston police of its dossier on Tamerlan Tsarnaev. Given the fact that the city was holding a mass public event—the marathon—there is no innocent explanation for such a “mistake.” One would assume that in the run-up to such an event, the authorities would be tracking every move of such an individual. More plausible, given what is already known, is the likelihood that the brothers, particularly Tamerlan, were being developed as assets for use in US imperialism’s operations in Chechnya, Dagestan and Georgia. Washington has maintained a longstanding relationship with Islamist extremist groups operating in Chechnya. Russia laid siege to the region in two devastating wars following the breakup of the Soviet Union in order to suppress separatist movements. In 2008, the US supported nearby Georgia in a war with Russia over the breakaway province of South Ossetia. Chechen separatists and Islamic fundamentalists, moreover, have been recruited by the US and its allies to participate in the US-backed war for regime-change in Syria, whose shock troops are being provided by forces linked to Al Qaeda.